Foto Republik Productions offers a variety of disc jockey options that enable us to provide value at every level. We specialize in many genres of music with a beautifully up-lit DJ booth color coordinated to your choice. We are one of the only event production companies that offer intelligent lighting standard in all of our affordable packages (subject to availability). Dance your night away to the sounds of feel good music from your introduction to your last dance. With over 10 years of experience in the industry don’t just book a DJ, book an experience. Book Foto Republik Productions. We service all events; Weddings, Birthdays, Corporate events and much more! At Foto Republik Productions we allow each client to personalize every aspect of their event. Every client’s needs, desires and priorities are different. Our DJ Booth which included 2 EV Speakers and 1 EV sub, 2 intelligent moving heads, 2 lighted towers and 1 lighted DJ facade. Colors can be customized to your event specifics! ALL STANDARD WITH OUR PACKAGES!!! 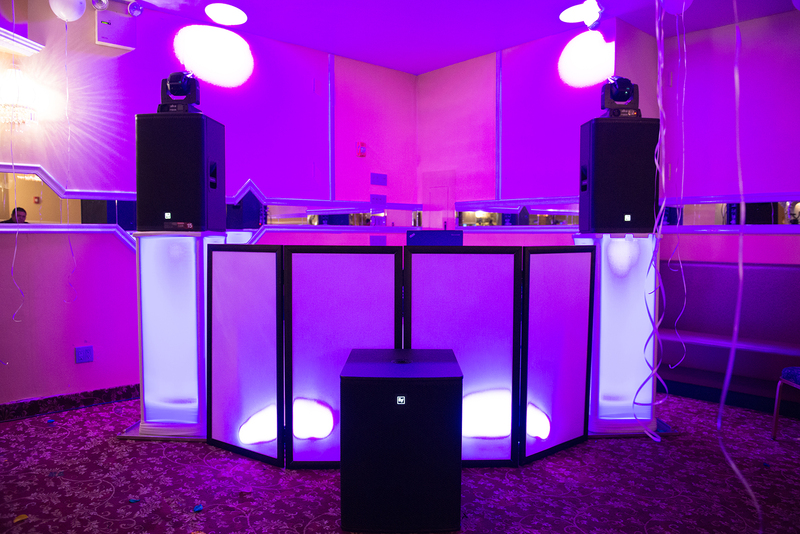 $1100 |  Reception coverage,  DJ and Uplit DJ Booth with Intelligent Lighting. We also offer DJ & MC combination packages or a solo DJ/MC to cater to all your event needs. Our in house DJ's specialize in all genre of music including but not limited to, Top 40, R&B, Hip Hop, Spanish, Old School R&B, Old School Hip Hop, Jazz, Reggae and so much more. Keep it simple, or do everything you can to make your celebration unique and unforgettable. To find out more about our DJ & MC services, packages or all-inclusive packages feel free to give us a call at 732.518.8787 or send us a message!